1. List and identify the four spheres of our Earth. 2. 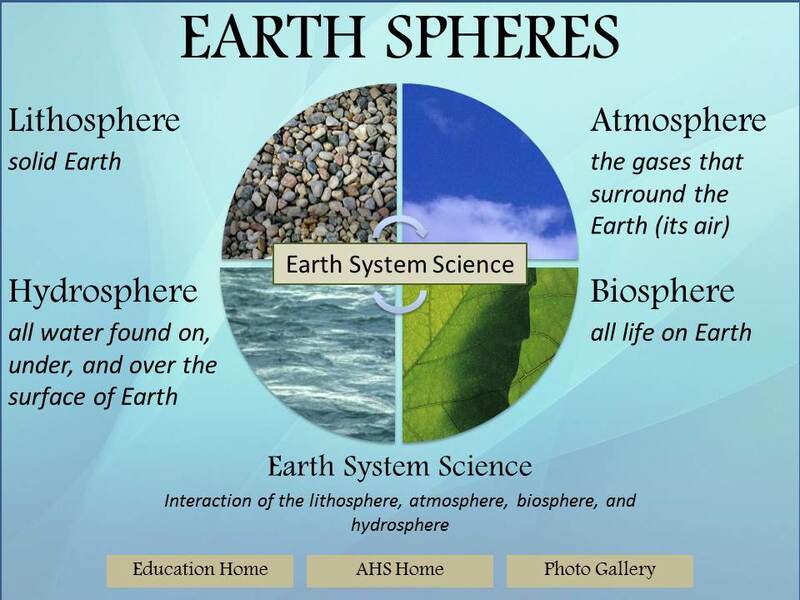 Explain how each of the spheres of our Earth interact with each other and provide concrete examples. 3. Describe the importance of the Gaia Hypothesis and how it relates to Earth's various systems. 1. Video of the Day: Watch the following Video: Earth's Spheres - Part 1 (7 min.) & Part 2 (13 min). and make point-form notes in your Video Journal before you start today's lesson. 2. Complete the multiple choice "quiz" below to further your understanding. Be sure to make note of the correct answers. 3. Complete Activity #1: The Gaia Hypothesis (Parts 1, 2 and 3) as outlined below. All responses and should be included in ONE google document and ensure that it is in your Module #4 Folder. 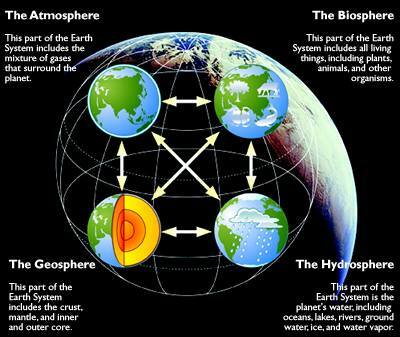 Everything in Earth's system can be placed into one of four major spheres: the lithosphere (land), hydrosphere(water), biosphere (living things), and atmosphere (air). Although these spheres can be studied independently, they are all part of the same interconnected system. Therefore, changes in any sphere ultimately affect the other spheres as well. The current "balance" among these complex interactions makes it possible for life to flourish on Earth. Complete the following activity for completion for Module #4. Read the following links on the Gaia Hypothesis. Search for and read at least two of the articles provided on the subject (articles included below). Post to the Module # 4 Discussion board on why you think you agree or disagree with the Gaia Theory. Comment on at least one other post from a classmate. Ensure you make reference to the articles in your report. Include a reference list of the articles. Watch the following video and complete the questions assigned in the link below. In addition, make point form notes in your video journal about each video (for future reference). Choose one Geographic / Environmental issue or event that has occurred in Canada in the past 3 years that has had various impacts on at least 2 of the following: the Biosphere, Hydrosphere, Atmosphere or Lithosphere. Write a 200 - 300 word paragraph that explains the impacts on the environment, people and wildlife from this event / issue. Include at least 3 images / graphics that supplement this summary. (be sure to be detailed and tie the synopsis back to the spheres that were influenced.